Shoes have been given a lot of power in modern society. They signal success, prosperity, a sense of style and femininity. Celebrities proudly show off their shoe "collections". I like the idea of shoes. But it's just emotional baggage. I don't need shoes to be happy. I don't need shoes to know I am successful. 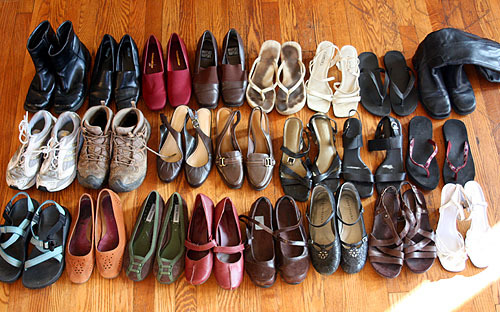 I knew shoes had to be one of the first things to be tackled in my quest to reduce what I own by one third. Plus I keep them all in a plastic bin in the closet; an overflowing plastic bin that I sift through regularly, leaving a mess of shoes on the floor of the closet. Now the old me would have wanted to create a better storage system One that would make my shoes more accessible, visible and take up less space. Not sure how this miracle would have been performed, but I would have tried. That or I would have continued to have my dysfunctional shoe bin. Instead I am going to reduce the shoes I own. It's that simple. These are my shoes. I only have 23 pairs. Nothing compared to the excess shown in the opening image, but way more than I need. In fact I'm a little chagrined to say some don't even fit me and some I've had a long time and only worn once or twice. It actually wasn't that hard. Here's the seven pair that got cut. I took them to Goodwill. Good-bye shoes. The best part, I rediscovered a pair of black boots I bought after visiting Bogota, Columbia where everyone had black boots. I decided to wear them for the day to see if I wanted to keep them. They pass muster and I have worn them multiple time this week. It's an unexpected bonus of going through my stuff. I'm finding things I forgot I had. Have you worn them in the last year? Are they significant (wedding shoes)? I'm not up for getting rid of my shoes, because I love them so much, but other things...definitely. We are in the process of moving and my motto is simplicty. But not with shoes! PS. I would love those black/silver slingbacks..very cute! I wish I could be a shoe person. I guess it is probably my wide feet that make me hate shoes and shoe shopping. It is probably a blessing that I don't have more shoes. I did throw away some old shoes that I found in the garage when I was cleaning it this fall! I had forgotten all about them. They were dirty work shoes in need of being thrown away that I'd just forgotten about. You are making me want to count the number of shoes I have however... I can think of a few pairs that I should just get rid of because they are outdated and I never wear them. I'm only holding on to them because I'm lazy... I'll throw them in the eventual goodwill pile. Someday they'll make it to Goodwill. I do think you chose the right ones to throw away... you have some really cute shoes! Great post...I need to purge, too!!! I need to purge my whole dang house. In fact the closet was first on my list for next week when I'm off from work. I love the feeling of getting rid of extra "stuff". If you're ever not sure what shoes to get rid of, just have my puppy come over and he'll pick for you! I recently got rid of three pairs of my shoes this way (including my all-time favorite Chacos) as well as a pair of my friend's shoes... You're welcome Josh! I'm not really a shoe person. I've got to work on clothes and miscellaneous kitchen items. I also have a stash of yarn and sewing scraps that is really ridulous. Actually, that's where I need to start. For Husband, it's books, brochures, pamphlets, catalogs and instruction manuals. He has got mountains of those. We packed them and moved them all twice during the forced-remodel this summer. Makes you stop and think how important this stuff is, or not. 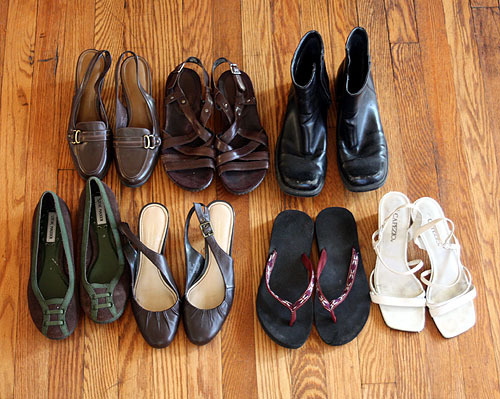 I am in the process of culling my shoes left over from my days of forced dressing up. I am keeping one pair of dress shoes, black, for occasions when I need to wear dress shoes. I have never been a shoe person either (glad LeAnn said it first, was beginning to feel like a freak), so this isn't painful, and it really is in fact a pleasure. This is a lot of fun Foy! Glad you guys are on board. And no, Clarissa, I don't deed to borrow you puppy, tempting as that is. Part as this has to be me deciding to get rid of the stuff. But if you ever want to visit you can bring your adorable dog. :) I'll put my shoes away first. Funny, shoes are one place that I both need to pare down and definitely need to buy more of. Books. Books are where I can't seem to pare down... I think I own more books than anything else (possibly more than most of the rest of the stuff combined).